The global antacids market has been displaying steady growth, and going forward it is likely to remain this way. The growth of the antacids market is primarily driven by changing dietary habits and growing geriatric population worldwide. The intake of medication for health conditions and increasing incidence of gastro esophageal reflux diseases generally among geriatrics is driving the demand for antacids among this population. For instance, the highest proportion of geriatrics in Japan in 2014, as per statistics of the World Bank is acting in favor of the Asia Pacific antacids market. The trend of self-medication for occasional heartburn and acidity and the easy availability of antacids over the counter is also driving the sales of antacids. Providing headwinds to the market is serious side effects associated with the prolonged use of antacids such as proton pump inhibitors and H2 antagonists and the rising popularity of generic drugs in underdeveloped and developing countries. 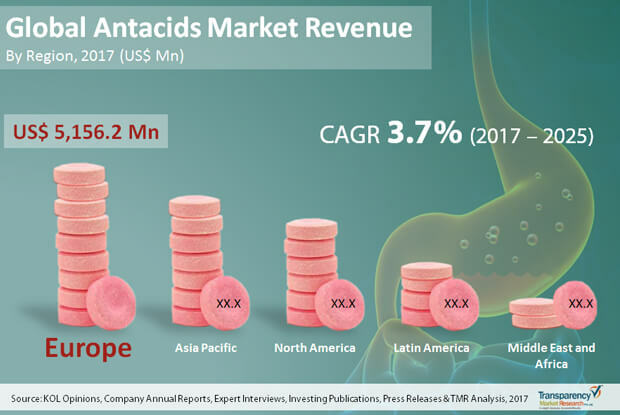 A report by Transparency Market Research (TMR), estimates the global antacids market will clock a 3.7% CAGR between 2017 and 2025, for the market to become worth US$18.7 bn by the end of 2025. The global antacids market could be segregated according to drug class, formulation type, distribution channel, and region. The leading segment for each category that could create ample opportunities for market players are studied as well in this report. On the basis of drug class, the market could be classified into proton pump inhibitors, H2 antagonist, and acid neutralizers. Amongst all, proton pump inhibitors led the market in 2016 and the trend is anticipated to continue over the forecast period. This is mainly because of their efficacy and easy availability as prescription and over the counter drugs as affordable price. However, acid neutralizers are expected to emerge as a significant segment on the back of their extensive use for occasional heartburn and acidity and due to their availability in a range of formulations and flavors. Depending upon formulation type, the global antacids market could be classified into tablet, liquid, powder, and others. Tablet was the leading segment in 2016 and is anticipated to hold on to its dominant position over the forecast period. Safety, convenience in administration and storage, and low cost factor are the chief factors aiding the growth of tablet segment of the market. The others segment, on the other hand, that comprises products such as melt in mouth micro granules and thin films is anticipated to display a robust CAGR over the forecast period. On the basis of distribution channel, the segments into which the global antacids market is divided are hospital pharmacies, retail pharmacies, and others. Of them, the others segment which include online pharmacy and drug store led the market in 2016. Rising adoption of e-commerce and increasing number of online medicine providers are fuelling this segment’s expansion. The global antacids market has been classified geographically into five key regions, namely North America, Asia Pacific, Latin America, Europe, and the Middle East and Africa. Europe held the leading share of the overall market in 2016 due to factors such as increasing incidence of gastro esophageal reflux diseases and growing geriatric population. The region being home to some of the key players is also stoking growth of this regional market. Asia Pacific stood as the second-leading market for antacids in 2016. The region is predicted to clock a robust 4.5% CAGR between 2017 and 2025 to account for the second-leading revenue through this period. China and India are key domestic markets in the region due to improvement of healthcare services. Leading players in the global antacids market profiled in this report include AstraZeneca, Bayer AG, Boehringer Ingelheim GmbH, Dr. Reddy’s Laboratories Ltd., GlaxoSmithKline plc, Johnson & Johnson, Pfizer Inc., Procter & Gamble, Reckitt Benckiser Group plc, Sanofi, Sun Pharmaceuticals Ltd., Takeda Pharmaceutical Company Ltd., and Valeant Pharmaceuticals among others. This report on the global antacids market analyzes the current and future prospects of the market. The report comprises an elaborate executive summary, including a market snapshot that provides overall information of various segments and sub-segments. The research is a combination of primary and secondary research, conducted for understanding the arriving trends, used to forecast the expected revenue of antacids used in various gastro esophageal diseases in the near future. Primary research formed the bulk of our research efforts with information collected from in-depth interviews and discussions with a number of key industry experts and opinion leaders. Secondary research involved study of company websites, annual reports, press releases, investor presentations, analyst presentation and various international and national databases. The report provides estimated market size in terms of US$ Mn for each drug class, formulation type, and distribution channel. In addition, the report provides estimated market size in terms of US$ Mn for various geographic regions for the period 2015 to 2025, considering the macro and micro environmental factors. The revenue generated from each product was calculated by considering their launch date in the market, customer acceptance, volume sales, price of the product, trends in industry, end user trend, and adoption rate across all the geographies. The market overview section of the report comprises qualitative analysis of the overall antacids market considering the factors determining the market dynamics such as drivers, restraints and opportunities, along with Porter’s five force analysis and market attractiveness analysis. In addition, market opportunity analysis for the drug class, formulation type, distribution channel, and key industry developments has also been provided. Key industry developments include the major events occurred in past 4-5 years and are expected to occur during the forecast period which are likely to affect the market dynamics. The market report comprises an elaborated executive summary, which includes market snapshot that provides information about various segments of the market. It also provides information and data analysis of the market with respect to market segments based on drug class, formulation type, distribution channel, and geography. The report also provides value chain analysis of the market that describes the sequence of activities involved, from identification of the market need to their final reach to the end users. All these factors will help the market players to decide about the business strategies and plans to strengthen their positions in the global market. Antacids can be defined as medicines used to suppress the acid production in stomach. They fall in different drug class depending on their mechanism of action. Based on drug class, global antacids market is segmented into proton pump inhibitor (PPI), H2 antagonists and acid neutralizers. Proton pump inhibitor are strong and effective drugs, used to inhibit the acid production. They are mainly used to treat gastro esophageal reflux diseases (GERD), peptic ulcers, etc. These drugs are often used for occasional heartburn, acidity, upset stomach, acid indigestion etc. This report analyzes the current and future prospects of the antacids market based on drug class, formulation type, distribution channel, and geography. Based on formulation type, the market is segmented into tablets, liquid, powder and others. The others segment which include melt in mouth granules, disintegrating thin films, gummies, etc. is likely to have steady growth during the forecast period, while tablets segment is projected to account for dominant share of global antacids market. Based on distribution channel, the market is segmented into hospital pharmacies, retail pharmacies and others. Retail pharmacies segment is anticipated to hold significant share and have steady growth during the forecast period. Others segment which include online pharmacies and drug stores is projected to account for dominating share in global antacids market. Based on geography, the market has been analyzed for major regions: North America, Europe, Asia Pacific, Latin America, and Middle East & Africa. In addition, the regions have been further segmented by major countries from each region. The report concludes with the profiles of major players in the global gastrointestinal drugs market such as AstraZeneca, Bayer AG, Boehringer Ingelheim GmbH, Dr. Reddy’s Laboratories Ltd., GlaxoSmithKline plc, Johnson & Johnson, Pfizer Inc., Procter & Gamble, Reckitt Benckiser Group plc, Sanofi, Sun Pharmaceuticals Ltd., Takeda Pharmaceutical, Valeant Pharmaceuticals International, Inc., among others. The major market players are evaluated on various parameters such as company overview, financial overview, product portfolio, business strategies and recent developments.